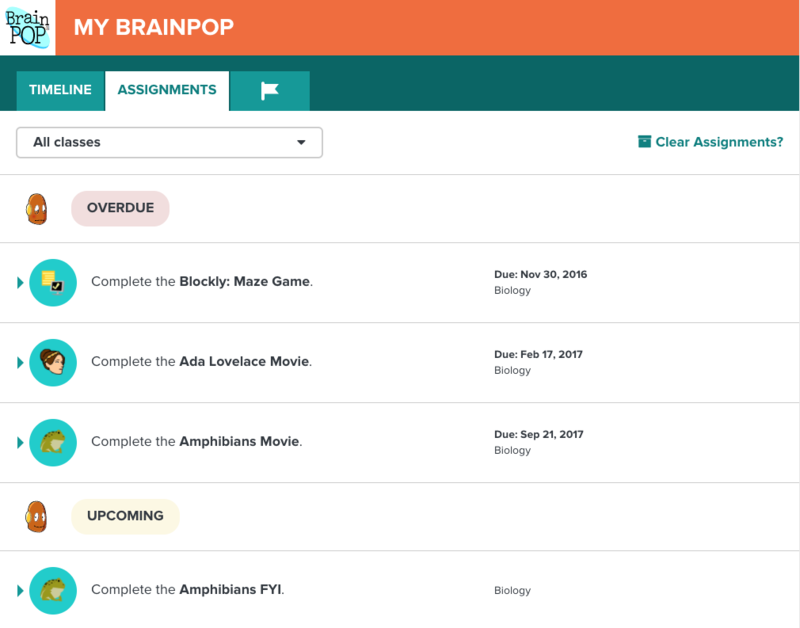 My BrainPOP educators can edit their assignments, assess student progress, and provide feedback and grades on student work. Click Assignments at the top of the screen to access, edit, and delete assignments. Expand the dropdown on any assignment to view progress. 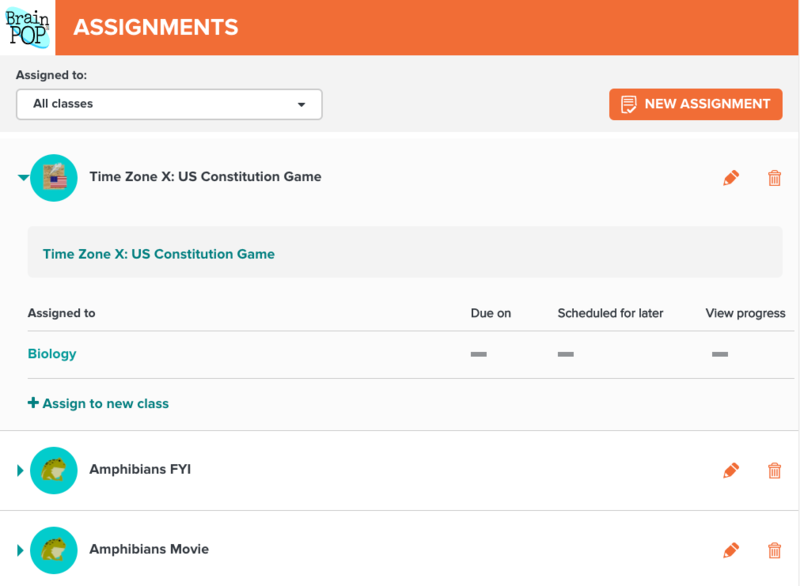 You can also filter assignments by class. Click the dropdown arrow next to the assignment you wish to view. Click the chart icon under “View Progress” to see individual student progress. From there, you will see the progress made on the assignment and whether students have completed, are in the process of completing, or have not yet submitted their quiz scores. 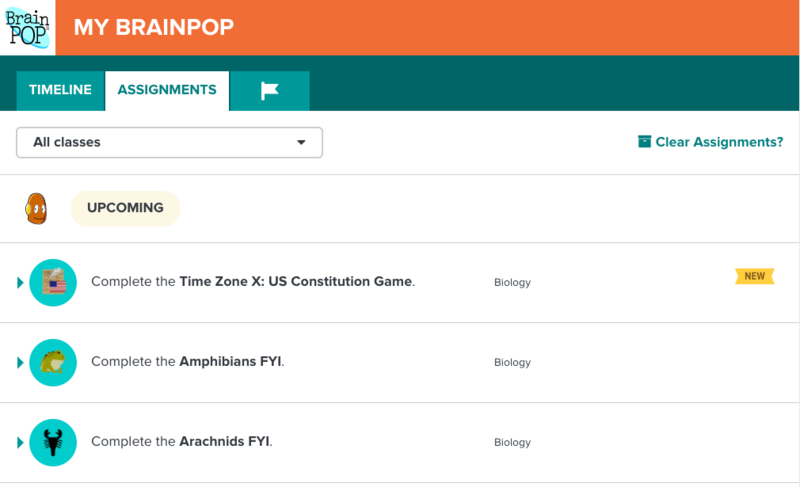 Sign into your My BrainPOP educator account, click Assignments and select the class you’d like to view, then click the bar graph icon in the relevant row. This will bring you to the Assignment progress page. To see a summary of class performance on a quiz, click the bar graph icon in the relevant column on the Assignment progress page. Here, you will see students' responses to each question on the quiz and a pie chart showing the breakdown of correct/incorrect answers. To view how an individual student performed on a quiz, click the student’s score in the Assignment progress view. Here, you can see which answer the student chose along with the correct answer. For assignments that require evaluation or feedback, such as Activities, Make-a-Map, and Make-a-Movie, click the speech bubble icon in the relevant column on the Assignment progress page to review and give feedback. After evaluating an assignment, a check mark appears in the speech bubble. How do students access their assignments? Students can see their assignments when they log in to their My BrainPOP student accounts. 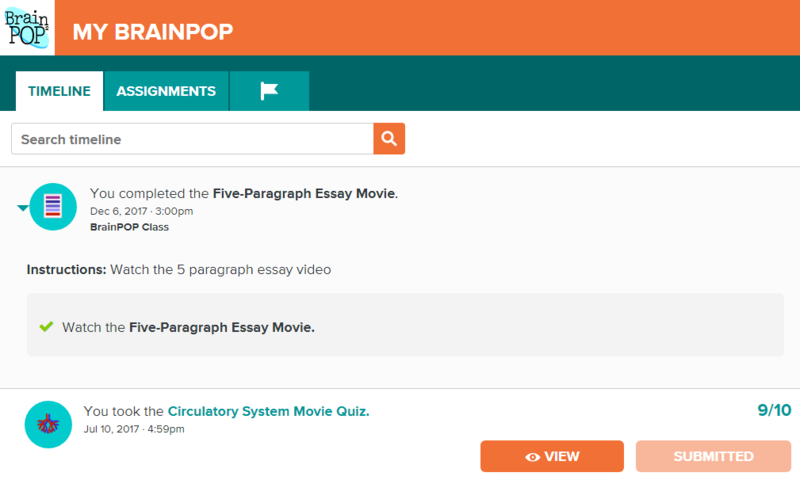 They click My BrainPOP or the popup notification to see completed and upcoming assignments. A green check mark appears next to each completed assignment. How do late assignments work? When students log in, they will receive a notification if an assignment is overdue. Students can complete late assignments, but they will be marked late. A new student joined my class. Will he or she automatically receive the assignments I previously assigned to the class? Yes. If a new student joins the class, they will receive all the active assignments assigned to the whole class in the student’s active assignment list. What happens if I delete an assignment? Deleting an assignment removes the assignment from your list in Assignments and from a student’s assignment list. Any assignments that have already been submitted before deletion will still appear in the educator’s timeline and spreadsheet view as well as the student’s timeline view.